Welcome to Whitney Orthodontics, where we have created winning smiles for patients of all ages since 1989. We are more than an orthodontic practice. Our office is a committed partner that believes in giving back to the community that has supported us and helped us become a household name. Hands down the best Orthodontist ever! Seriously. Very compassionate and they really care about your teeth. Professional staff that greets you and make you feel comfortable. Absolutely the best. Everyone here is extremely nice. They do a great job explaining the plan and answering any questions you may have. Always enjoy our visits here. I have been with them for years! They have wonderful service and wonderful people here. No other orthodontist can top them! I now have my dream smile because of them. Dr. Whitney reassured my daughter when her nerves were high. Thanks for your sensitivity and knowing just what to do to make it all a positive experience. She can't wait for her next appointment. Thanks for that extra attention! Will highly recommend to family and friends. I could not have been more pleased or impressed with all of the staff at this location. This was my oldest child's first visit to an orthodontist, and not having experience with them myself, I was nervous. It was needless. The staff here was so thorough in explaining everything. They were honestly interested in the best outcome for my child, without rushing into unnecessary treatment. They are willing to do everything they can to make your child comfortable with the process from start to finish. I will definitely be recommending them to friends, and may even end up a patient there for some work I need done. So glad our dentist suggested this practice. 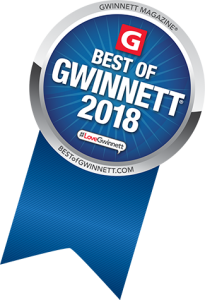 Our team is honored to be voted Best of Gwinnett 2018 (and 2017, 2016) by Gwinnett Magazine. At Whitney Orthodontics, believe that orthodontic treatment is not just bringing teeth into proper alignment. We want to make sure our patients have a wonderful experience. Our entire team will treat you like family while taking you through every step of treatment. We want to leave you feeling proud to tell your friends about the professionals who helped you achieve your ideal smile. We offer traditional metal and self-ligating braces, and incorporate the latest technological advancements in orthodontic treatment to provide fast, effective treatment that is more comfortable than ever. Many patients tell us they enjoy and look forward to visiting our office. That’s by design. We want you to feel comfortable and at home. Our game room has Xbox consoles and two old-school arcade games, an iPad station, and an ice cream freezer you can visit after each appointment. Monthly contests and a rewards hub keep our patients excited about their treatment. Orthodontic SEO and Websites by Prodentite.